If I'm to give anything to UK Social Policing from now on, it's going to be on the side of innovation and making things happen that have either not been done yet or do not technically exist..
From my understanding, it seems there are clear rules set down by the UK Police who qualify for and therefore display the familiar blue badge beside their name. For example a UK Police Chief Constable, DCC, ACC, an official main force account and a Community Neighbourhood or Specialist Policing Team. Yet even some verified accounts are missed off (see the NPCC Chief Constable list). From the NPCC Chief Officer list, that's even more sporadic. Thankfully, that's not the focus of this post - if it were, it would be a very simple logic route.. Are you a CC, DCC or ACC? If yes - get verified.. If no - take no action. An example of a verified Community Neighbourhood is @Coventry_Police or a specialist team like Aviation Policing as @MPSHeathrow. There are many other accounts that follow this pattern. Most will have a place name and the word police in the twitter username, but not all. One example is an account that appears to be an officer, but really is a Neighbourhood. Where it clearly says Insp Steve Bunn as the verified name, yet it's explained as a South Leics NPA account. I believe the system of verifying UK Police twitter accounts to be outdated and should be reviewed. Twitter is a public social network and ultimately Twitter should decide who they feel is worthy of being verified. 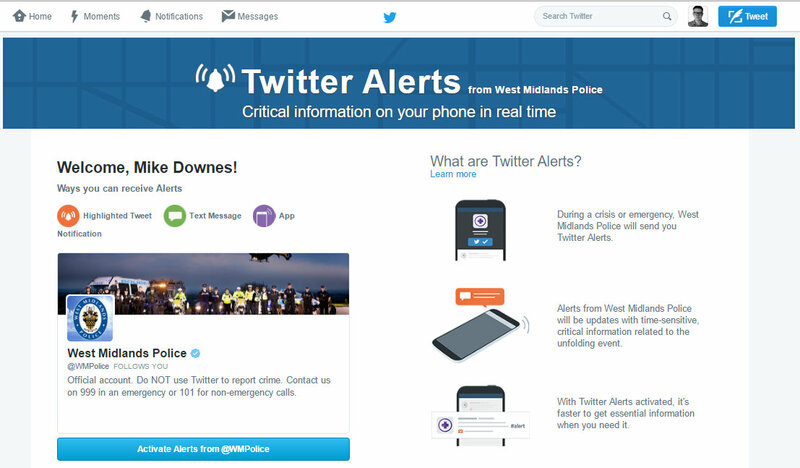 From what I know (and it's very little), there seems there is an obvious working relationship between the UK Police and Twitter which may have been accelerated after the Aug 2011 riots. 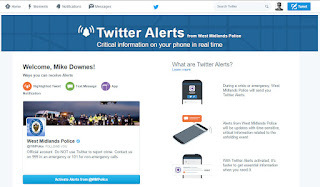 [please take a moment to under the red bell alert and text, In times of crisis, this account helps share critical information with Twitter Alerts on every profile. From what I understand, the process is very simple - an account gets followed by @verified and maybe a few days later the blue badge appears as if by magic. Or and it's a big Or ... an official from the UK Police asks twitter, or even hands in a list of accounts and the magic happens that way. This is all well an good for local UK force policing, maybe even nationally in the UK - but when an account is viewed globally, it's totally ridiculous and makes no sense (in some cases). Before I get into specifics, let's take a moment to learn about the FAQs of verified accounts. from that link, here is a summary..
Twitter verifies accounts on an ongoing basis to make it easier for users to find who they're looking for. The College of Policing is verified (with 5.3k tweets and 23.7k followers) - yet Insp Michael Brown as @MentalHealthCop who is a Mental Health Coordinator at The College of Policing is not verified despite having made 74.4k tweets and having 29.4k followers. Insp Brown has won many awards including the Mark Hanson Digital Media Award and #SMILEcon 2014. Superintendent of Operations at West Midlands Police Kerry Blakeman as @kerryblakeman is not verified despite having an international presence and being winner of an International Social Media Top Cop 2015 award. Supt Kerry is also the host of #WMPLive at facebook. John Sutherland as @PoliceCommander has a healthy presence on twitter, always has some brilliant and often heartfelt words at twitter and his blog. Of course not verified. And whenever I look he's always in the press (standard). Neil as @sgtTCS is another one not verified despite making 75.5k tweets and having 15.6k followers. You may remember it was sgtTCS who founded the #DontStreamAndDrive campaign (BBC News 31 March 2016 includes a video). 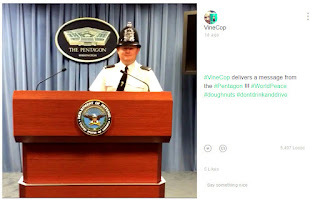 PC Mark Walsh from Hampshire Police also known as #VineCop has 2.16 million Vine Loops and has just returned from a successful #SMILEcon Conference in Alexandria, Virginia - He is not verified at twitter and therefore not verified at Vine either. 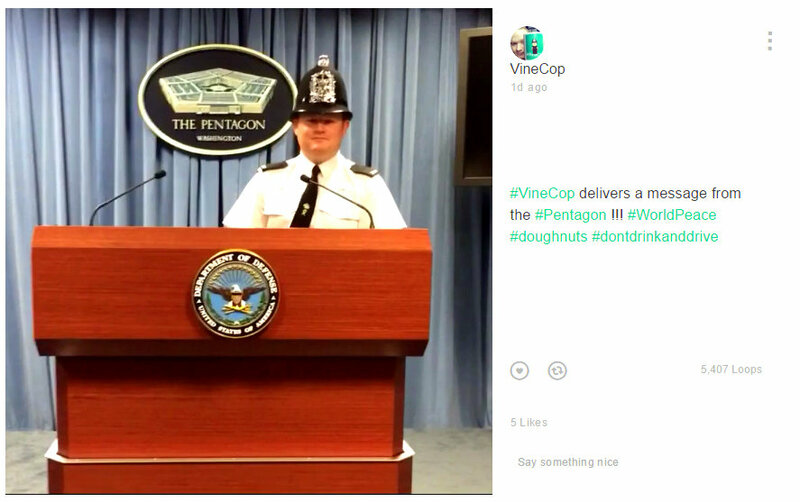 PC Mark stopped by The Pentagon a few days ago in his UK Police uniform and hat. I will add to this list as we discover more valuable UK Police Officer accounts. To illustrate the point, the five examples maybe adequate at this stage. The UK Police should learn from other Police Forces. In this case how the Toronto Police Service use a twitter banner naming nine officer who tweet for the TPS. Notice how some of the TPS Officers are verified (like Meaghan Gray, Scott Mills and Laurie McCann). Another example is @TrooperBen, @TrooperTodKHP and many other Troopers, Official account of the Kansas Highway Patrol PIO (Public Information Officer) - All verified accounts and although 4,421 miles away in person - social policing is just a click away. One simple test, ask which UK Police Officers have a significant social presence or hop on a plane, ferry or EuroStar to other countries. And then ask if they are noteworthy and valuable enough as an export to be verified on Twitter. UK Police take a speedy look into this issue and get it sorted. 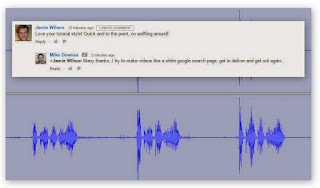 Twitter take a speedy look into this issue and also get it sorted. UK Police and Twitter together take a speedy look into this issue and get it sorted. Declaration of Interest by Mike Downes - I would not be posting this issue today without having posted about Social Policing in the last five years. And as such having connected with many, but not all of the officers mentioned above. That does not mean I want all of them verified as I know them or even class a few of them as friends..